Interest in grey wares on Crete increased over the past years thanks to new finds (Hallager-Hallager 2002; 2003; Rutter 2006b) and contributions, which have provided an occasion for an update on pottery imported from outside Crete and also on wheel-made grey ware (Watrous 1992, 149-183; Rutter 1999; 2006b). Recent overviews have also expanded the list of the LM III evidence to some extent (Tsipopoulou-Vagnetti 1994, 47-48; Kalogeropoulos 1998, 48, 55, 59, no. 20-25). As this overview will show, the data have not increased in recent years (Figs. 1-2), with the exception of Kommos and Chania; on the contrary, most of the information comes from old excavations and publications, from a time when both the identification and terminology of this ware were far from being easily recognizable (i.e. the use of term bucchero). Here it seems useful to sum up some of the conclusions that will be drawn subsequently. Thus far, Grey Minyan Ware (henceforth GMW) is a rare item in Pre- and Protopalatial Crete, and its scanty evidence over all of the island confirms the picture of an asymmetrical relationship between the Greek mainland and Crete, which saw a large quantity of Minoan and Minoanizing pottery in coastal sites of southern and northeastern Peloponnese, but not the contrary. Grey Ware (henceforth GW) during the Neopalatial period remains an exception and – as of yet – does not include any imports from Greek Mainland. Grey-burnished wheel-made vessels are exclusively produced in Minoan shapes; furthermore, in view of the occurrence of specialized forms, such as the alabastron, it has been suggested that they had a special function and were imitations of stone or metallic vases. During the Mycenaean period the evidence for GW increases dramatically. GW vessels found in cemeteries are usually closed shapes and miniature size, and they might be interpreted as part of the Mycenaean funerary customs similarly attested on the Mainland and the eastern Aegean (i.e. Dodecanese). GW from the settlements is concentrated so far at Kommos and Chania, and it shows elements of local production besides, in the latter case, vague similarities with the pseudominyan ware from southern Italy. In the following text the terms Neopalatial and Postpalatial will indicate respectively the Middle Minoan III–Late Minoan IB and Late Minoan II–IIIC frameworks. Although in the last case the period has been subdivided elsewhere into Mono Palatial (LM II–IIIA1) and Final Palatial (LM IIIA2–IIIB), the present account will consider evidence that does not always offer firm grounds for distinguishing between IIIA1 and IIIA2 as well as between IIIA2 and IIIB. Therefore, the use of the term Post Palatial seems more appropriate. The first evidence of GMW on Crete comes from Knossos (Hood 1971, fig. 1). Two large fragments of a rounded bowl with everted rim were found on the south side of the Royal Road, located at the northwest corner of the palace (Hood-Smyth 1981, 51, no. 214–215). The bowl is handmade with a slightly sandy and greyish brown fabric; the exterior surface and the inner rim are burnished, and five shallow groves are on the shoulder, on which a vertical strap handle is more than half preserved. The vase was found in a rubbish fill, probably created during MM IA, as the latest fragments seemed to show. Considered an Early Helladic III import by S. Hood, the bowl can be dated to Middle Helladic IA (Zerner 1978, 178, 197; Rutter-Zerner 1984, 81). S. Marinatos reported the notice of a small vessel in grey ware from Palaikastro (Marinatos 1927–1928, 80, footnote 3). The vessel is a MM IA beaked jug, which, although described as consisting of grey bucchero clay, is entirely Minoan; and in view of its very distinctive torsional bands formed by barbotine ridges, it belongs to the Drakones type (Hutchinson 1939–1940, 38, pl. 14 f.). The bowl from Knossos belongs to the best variety of Grey Minyan Ware on the Greek Mainland, called by C. Zerner ‘True Grey Minyan’, to indicate a distinctive variety of Minyan Ware produced in Central Greece, perhaps at Orchomenos or another site in Boeotia (Zerner 1993, 47). Comparisons with Lerna V may suggest an early or middle stage of MH I (Zerner 1978, 178, 197; Zerner unpublished, figs. 10, 14). The Helladic import at Knossos fits with the intensification of Hellado-Minoan relations that increased significantly during the first two centuries of the Middle Bronze Age (Rutter-Zerner 1984, 77–80). Nevertheless, it should be noted that, in spite of the considerable quantity of Minoan and Minoanizing pottery at coastal sites on the southern and northeastern Peloponnese, the Minyan vessels at Knossos are the singular ceramic testimony of such a network in Crete so far. In view of such an asymmetrical relationship, as long as other GW does not appear on Crete, it might be reasonable to hypothesize that the Mainlanders exchanged metals for Minoan pottery (Rutter-Zerner 1984, 77–79). The mention of Minyan vessels during this period is very sporadic. A. Evans made a note of a Grey Minyan chalice from the destruction filling operation of the House of the Sacrifice Oxen, located at the SE angle of the palace of Knossos. The find is registered as “one fragment of a stem, apparently of a true Minyan chalice of the grey ‘through and through’ ware” (Evans 1928, 309). The re-examination of the deposits from this house by A. MacGillivray has produced a MM IIIA date for the chronology of the filling operation (MacGillivray 1998, 46-49). Unfortunately, neither a photo was published by Evans nor this fragment is reported by MacGillivray’s publication, hinting at a possible misinterpretation by Evans. Supposing the fragment did get lost, there are probabilities that Evans referred to a foot-stemmed goblet, very common throughout MH II and MH III. A grey ware vessel was recently published by C. Macdonald from the Area South of the Domestic Quarter of the Palace; it is dated to a mature stage of LM IA (Macdonald 1996, 21, fig. 3). Among the set of five bridge-spouted jars found near the Drain Shaft, one particular vessel stands out: it is the only one with a strainer spout and made in burnished grey ware. Given the pyriform shape, the coil handle and moulded base, this jar has been considered as belonging to mature LM IA. A grey burnished round-mouthed jug with one vertical strap handle attached to the rim was found at Tylissos (Khatzidakis 1912, 206, fig. 10:d). This jug also has a moulded base; it is datable to LM IB. A wheel-made grey alabastron was found in a LM IB context at Kommos (Watrous 1992, 15, no. 270, fig. 18, pl. 6; Rutter 2006a, 459–460, no. 40/19, pl. 3.44). This unique piece has two double-horned lugs on opposite sides of the shoulder and is considered by J. Rutter as an import from an unknown Minoan centre (Rutter 2006b, 678–679). Finally, C. Blegen informed that scanty fragments of Minyan ware came to light in eastern Crete (Blegen 1928, 150; Rutter-Zerner 1984, 82, Appendix IV.A.1). As far as western Crete is concerned, the existence of an unburnished grey-blue fabric, datable between MM III and LM I and found at Nerokourou near Chania (Vagnetti 1985, 33, footnote 17; Tzedakis et al. 1989, 133), can be explained as a clay fired at a very high temperature, rather than as proper wheel-made grey ware. Due to such a small number of pieces, it is not easy to understand the real value of the GW production and distribution during this period. The three vessels mentioned above are very distinctive, and the dearth of other GW artefacts makes even more clear that, beyond any Middle Helladic reminiscence, these vessels had a special function, such as a container for some costly liquid or a not fully comprehensible ritual purpose. In the cases of Knossos and Tylissos the shapes have large comparisons within the Minoan sphere of pottery production, but at the same time the presence of the moulded base and their context may suggest an imitation of stone or metallic vases. The Knossian jar from the Drain Shafts was found together with four other bridge-spouted jars, with a bifacial white-on-dark double axe decoration, and with LM IB fragments, including a Marine style conical rhyton and a globular alabastron. This evidence has been taken by Macdonald as proof of some cult activity in the area, even after the destruction in mature LM IA (Macdonald 1996, 21, 23). Likewise, the alabastron from Kommos Civic Centre. Both L.V. Watrous and J. Rutter have suggested the possibility that these earlier GW vessels, such as the alabastron, may have been intentional imitations of containers carved from stone, such as steatite (Watrous 1992, 15; Rutter 2006a, 468; Rutter 2006b, 679–680). Admittedly, the surface treatment of other vessels from the same LM IB period is not dissimilar from the fine grey-burnished alabastron, suggesting that the burnishing of the dark paint on a few vessels was meant to render the dark-coated surface more lustrous and similar to a stone vessel (Rutter 2006a, 475. See also Rutter 1979). The presence of wheel-made grey burnished vessels during LM II is testified again at Knossos. More precisely, two vessels of this ware come from the Unexplored Mansion: a teacup with a wishbone handle and a trick vase with an internal funnel and vertical strap handle attached to the rim (Popham et al. 1984, 163–164, 170, pls. 84: b-c, 87: d, 161: 6, 162: 5). In both cases there is not any proper correspondence with the current LM II pottery production, and again wheel made vessels are not part of an ordinary set, but very exclusive. As for the wishbone-handled cup, it is part of a not vast circulation of wishbone-handle vessels that makes its first appearance on Crete during LM IB and occurs in both domestic and funerary contexts during LM II-IIIA (Graziadio 1999). Nevertheless, the Grey Ware bowl from the Unexplored Mansion, because of its exotic feature, raises the question of any possible interference between metal and clay production. At any rate, these two LM II Grey Ware vessels share the same spirit of the Neopalatial ones. The presence of GW in Crete increased from the LM IIIA onwards, and evidence for this comes from both cemeteries and settlements. Fine wheel-made grey vessels have been found in five cemeteries: a cup is mentioned from tomb IX-D at Mavrospileo (Knossos) (Forsdyke 1926–1927, 269, IX-D.13); a hemispherical handleless cup from the chamber tomb of Karteros (Amnisos) (Marinatos 1927–1928, 73, 80, fig. 6, pl. 2:18); a ring-shaped askos (FS 196) from chamber tomb B at Stamnoi Pediados (Platon 1952, 628, fig. 8); a couple of juglets and one carinated bowl from Mochlos (Banou-Nicgorski-Smith forthcoming) 1; a globular askos (FS 195) from a pithos burial at Aissa Langadha (Pachiammos) (Boyd Hawes et al. 1908, 46, pl. 10:16); and a three-handled pyriform jar (FS 46, 48) from the Pharmatokephalo-Sklavoi (Sitia) cemetery (Tsipopoulou-Vagnetti 1994, figs. 1–2). Unfortunately we do not have any illustration of the cup from Mavrospileo. The vessel is described as a ‘curved cup’ in black bucchero. Also the chronology of chamber D is controversial, as the pottery evidence comprehends MM IIB, MM III, LM I and LM III vessels (Forsdyke 1926–1927, 268–269). The vessels from the Karteros-Amnisos tomb are dated to LM IIIA2/B and LM IIIB initial (Kanta 1980, 39–40). The GW cup has a very distinctive shape with its ribbed rim and the presence of two concentric grooves on the interior bottom; it might be seen as a GW variant of FS 208, the grooved-side type, well known during LH IIIA2 (Furumark 1941, 619–620; 1992, pl. 120), or, even as a clay imitation of LM IIIA metallic prototypes, also reported from Crete (Sellopoulo, Tomb 3) (Popham 1974, 242, fig. 25.11. H). The larnax, where the cup was found, also held two fireboxes and three cups with a pulled-out spout, a band on the rim and plastic knobs (Marinatos 1927–1928, 73, pl. 2:16–17), which suggest a LM IIIA2 date for the burial. Re-examination of the grave offerings in the Stamnoi chamber tomb allows a date for the grey askos between LM IIIA and B (Kanta 1980, 53, 58), while the globular askos from Aissa Langadha has a debatable chronology between a LM IIIA2 (Kanta 1980, 143; Hallager-Hallager 2003, 231) and a LM IIIB date (Misch 1992, 163; Kalogeropoulos 1998, 59). The date of a not particularly advanced stage of LM IIIA is offered for the three-handled jar from Pharmatokephalo-Sklavoi (Tsipopoulou-Vagnetti 1994, 45). Finally, evidence from Mycenaean cemetery at Mochlos started during LM IIIA1, reaching its peak at LM IIIA2 (Smith 2005). Additionally, Marinatos reported the notice of a grey stirrup jar (IM 4470) from the cemeteries of Knossos without any other indication (Marinatos 1927-28, 80, footnote 3). Also, M. Tsipopoulou and L. Vagnetti inform of the acquisition of a small wheel-made grey stirrup jar from the Mitsotakis Collection together with several vessels of Kydonia workshop manufacture. They do not exclude a provenance of the whole set from a west Cretan funerary context (Tsipopoulou-Vagnetti 1994, 47, footnote 16). The fine wheel-made grey ware with 7 out of a total of 353 imported vessels identified represents only 2% (Rutter 2006b, 683, table 3.115). Six grey wheel-made vessels datable to LM IIIA1, IIIA2 and IIIB have come to light in different regions of the settlement (Hilltop, Central Hillside, House X, Civic Centre): a small LM IIIA askos (Rutter 2006b, 678), two juglets of LM IIIA1 (Watrous 1992, 46, no. 803, fig. 76, pl. 53; Rutter 2006b, 678–679) and LM IIIB (Watrous 1992, 88, no. 1544, fig. 76, pl. 58; Rutter 2006b, 678–679), and three cups, one shallow teacup from a LM IIIA1 context (Watrous 1992, 30, no. 514, fig. 23, pl. 53; Rutter 2006b, 678–679), and two smaller of LM IIIA2 (Watrous 1992, 164, no. 672, pl. 56; Rutter 2006a, 576, no. MI/Cr/5, pl. 3.87; Rutter 2006b, 678–679). The largest collection of fine wheel-made grey vessels of the LM III period has been reported from Chania (Agia Aikaterini Square excavations), mostly from LM IIIB2 and IIIC strata (Hallager 1983). Seventy-five sherds have been inventoried from LM IIIB2 levels (4 of LM IIIB1/2 and 71 of LM IIIB2). They are wheel-made with dark grey burnished surfaces and belong entirely to open shapes (Hallager-Hallager 2003, 254–256, 298–299, pl. 86). Aside from two unusual shapes (a spouted cup and a cup with a slightly flaring rim and a vertical handle attached below it), the majority of the sherds belongs to two shapes: the kylix and the carinated cup, the latter of which is the most predominant. Finally, other fragments belong to a rounded cup type (Hallager-Hallager 2003, 255). Cups have high-slung handles, are roll to oval in section, and the bases preserved are of three types: flatted, raised and ringed. Twelve sherds have been reported from LM IIIC strata. They have the same fabric and surface treatments as the LM IIIB2 ones and belong to rounded and carinated cups (Hallager-Hallager 2000, 166–167, pl. 51). The single sherd preserved with handle has a vertical handle, oval in section and raised above the rim; only raised bases are attested. Finally, seven fragments were found in post-Minoan levels: one fragment of a solid stem kylix, and another six that seem to belong to the carinated cup with a high-slung handle (Hallager-Hallager 2000, 171). Nine LM IIIB2 and two LM IIIC sherds have been chemically analyzed and are similar in composition to the local ware (Hallager-Hallager 2003, 304–305). More specifically, the local production of GW, being very low calcium, is close to the non-calcareous White Ware, but some sherds also resemble the more calcareous and iron-rich Plain and so-called LM IIIC wares (Hallager-Hallager 2003, 305, table 2). The present state of knowledge reveals the concentration of GW in the two main port settlements of Postpalatial Crete. Variously explained as the sign of Mycenaean presence (Tsipopoulou-Vagnetti 1994, 48–49; Tsipopoulou 2005, 311) or as the result of the long Cretan tradition of ceramic imitations of stone vessels (Rutter 1979, 1999, 180; 2006b, 679–680), the wheel-made grey ware is still waiting for a definitive response. Moreover, the evidence clearly reveals the existence of many dichotomies (cemeteries/settlements, Kommos/Chania), which need to be commented upon briefly here. As far as the first point is concerned, GW in funerary contexts appears only in LM IIIA period, and it appears in northern Crete. It is also worthy of note that the majority of these vessels belongs to closed shapes and that some of them are small or miniature. This peculiarity allows the hypothesis that they were containers of special liquids for ritual offerings (Tsipopoulou-Vagnetti 1994, 48–49). On the opposite, wheel-made grey vessels from the settlements display mostly open shapes (cups, and more rarely kylikes). Nonetheless, the pattern noted in Kommos and Chania also shows distinctive differences pertaining to the chronological distribution on one side, and the fabric and shapes on the other. As for Kommos, the recent assessment by Rutter of fine wheel-made grey ware has corrected some previous ideas of the pioneer study of Watrous, in which the latter considered most of these vessels not as Minoan, but instead as ‘Italian’ imports (Watrous 1992, 164–165). On the other hand, Rutter stresses the differences concerning shape, fabric and technology between the Kommos GW and the rest of roughly contemporary wheel-made grey vessels, which are known from southern Sardinia, southern Italy, the Greek Mainland (Tiryns, Dimini), and western Crete. Likewise, he also excludes connections with northwest Anatolian GW and opts for a Cretan production, which is not necessarily located in the western Mesara (Rutter 2006b, 678–679). At Chania the few sherds from LM IIIA–IIIB1, still unpublished, belong, as in the case of Kommos, to closed and in some cases miniature vessels (Hallager-Hallager 2003, 255), but the majority of evidence comes from the LM IIIB2 and IIIC levels, filling the chronological gap of Kommos. The Chania evidence is striking on account of the large number of vessels, but also on account of shapes not attested at Kommos, most of all the carinated cup. B. Hallager has also pointed out that, with a single exception, the wheel-made grey vessels were found in the same contexts as Handmade Burnished Ware (henceforth HBW) (Hallager 1983, 361; 1985; Hallager-Hallager 2003, 254). The author has regularly underlined the strong similarities between HBW and the southern Italy local impasto vessels of the Subappenine culture, on the one hand, and those between GW and so-called pseudominyan ware from southern Italy on the other (Hallager 1983; 1985; Bergonzi 1985, fig. 19.3–6; Kilian 1988a, 133, fig. 7; Kilian 1988b, 145–149; Hallager-Hallager 2000, 165–166, 171; 2003, 253–256). The peak of GW in LM IIIB2 coupled with the coexistence of both GW and HBW also seem to support the Hallager hypothesis that the two wares were locally produced at Chania by or for an Italian ‘colony’. Nonetheless, this hypothesis has not been accepted unanimously (Vagnetti 1985, 32–33; Peroni-Trucco-Vagnetti 1986, 68–69; Tsipopoulou-Vagnetti 1994, 48–50; Bettelli 1999, 466; Bettelli 2002, 128; Jung 2006, 50). For L. Vagnetti the possibility of a Mycenaean influence on LM IIIB GW must not be disregarded, for the production of GW on the Mainland had an interrupted development in MH tradition, which during LH II and IIIA used Mycenaean shapes for GW, unknown in that period in Italy. Yet, she points out that the Cretan tradition in GW production, although feeble, did not break off during LM I and II. Furthermore, it has also been noted that despite the occurrence of similar shapes (carinated cups and bowls) in both southern Italy and Chania, those from the Cretan centre show some significant differences (Bettelli 1999, 466, footnote 29; 2002; Jung 2006, 128). While carinated cups from Chania have slightly more rounded profiles, less flaring rims, and not very high-slung handles that are roll to oval in section, the examples from Italy (see especially the case of Broglio di Trebisacce, where the highest concentration of southern Italy GW, or pseudominyan, has been found) have more pronounced carinated profiles. The upper bodies are also more flaring, and the handles, usually strap in section, do rise pronouncedly above the rim (Belardelli 1994; Bettelli 2002, 198–249). In the end, it is worth stressing that apart from carinated cups, there are other shapes in Chania, such as the kylix and the spouted cup, which so far have not been attested in the wheel-made grey ware production of southern Italy. In the light of this evidence, the asymmetrical character of GW distribution during LM III might be likely explained acknowledging the existence of many centres of production and pottery traditions. Admittedly, the presence of closed and/or miniature GW vessels in funerary contexts recalls a Mainland tradition, but it is equally widespread in the southeastern Aegean (Kalogeropoulos 1998, 57–60; Benzi 1996, 955–967). Thus, it seems reasonable to view GW vessels as locally produced in Crete, but, at the same time, inspired by a Mycenaean funerary attitude. How much the Minoan tradition of perceiving GW as an imitation of stone or metallic vessels could have played a part is hard to estimate, but it is indisputable that such distinctive vessels circulated as valuable objects. On the other hand, the settlement pattern suggests a different approach. Taken as a whole, the imported vessels from Postpalatial Kommos and Chania witness two different exchange networks: one more interested in the eastern Mediterranean and western Anatolia, but also in Kythera, the Greek Mainland and southern Sardinia as the first (Rutter 2006b), and one shared between Cyprus and southern Italy as the second network (Hallager-Hallager 2003, 263–263). The extraneousness of GW at Kommos from the rest of foreign contexts, where this ware has been attested, suggests its local production, and perhaps, according to Rutter, that it was still under the Minoan tradition of imitating stone vessels (Rutter 2006b, 679–680). Also, the HBW at Kommos has a Sardinian provenance, and it is quite different from that attested in both southern Italy and Chania (Bergonzi 1985; Hallager-Hallager 2003, 253–254, pl. 84–85; Rutter 2006b, 677–678). As for Chania, if, on the one hand, the simultaneous findspot of both GW and HBW, the shape familiarities between these and the pseudominyan ware and local impasto of southern Italy respectively, and the presence of the most distinct Italian GW shape (the carinated cup) make an Italian connection for the local production of GW suggestive, then on the other hand, the formal dissimilarities make such an interconnection vanish, for a local Cretan production of this ware is more preferable. Regardless of some familiarity with the Italian pseudominyan ware, GW from IIIB and IIIC levels at Chania show a stronger connection with the Mycenaean local production. It therefore seems more probable that GW was locally produced and inspired by Minoan-Mycenaean models. Unlike the HBW, which had no former Aegean ancestry and is certainly ascribable to Italian models, the GW class is not completely extraneous to Crete. Its irregular appearance and distribution during the Postpalatial period shown above make clear how dangerous the use of a single model can be when attempting to understand the GW phenomenon; rather, it can prove: (1) the different degrees of circulation of GW (vessels for burial gifts and for domestic uses); (2) the co-occurrence in one case (Chania) with HBW, which reminds us of the situation in House 127 at Tiryns Unterburg (Belardelli-Bettelli 1999); (3) the possible perception of GW as a ware both similar to and different from the proper Mycenaean ware; (4) the interaction of both a Mycenaean tradition and a new manufacture that has been ascribed to the coming of people from Italy to Greece, as the cases in Tiryns and Dimini on the Mainland confirm. Like the Greek mainland, during LM IIIB and IIIC Crete as well shows a similar circulation of HBW and metal artefacts that exhibit strong resemblances with European mainland artefacts and specifically Italian ones (flanged-hilted sword, violin-bow fibula, flange-hilted dagger of Pertosa type, radiate-wheel pin) (Carancini-Peroni 1992; Bettelli 2002, 132–137; Eder-Jung 2005). Furthermore, the co-existence of both GW and HBW, on one side (only at Chania), and that of HBW with bronzes in shapes that are widespread in Italy, on the other (Chania, Knossos), can better explain how between LM IIIB and IIIC GW was part of a greater phenomenon that saw an exchange of techniques and ideological values. The hypothesis of the sudden shortage of copper, the lifeblood of the Bronze Age political economy, as the incentive of an increasing involvement of western Mediterranean communities with entourages of Mycenaean societies looks very reasonable, but it needs to be verified. Especially, after the collapse of the Mycenaean palatial system the drying-up of raw materials may have stimulated movements from Italy towards Greece of bronze-smiths, who became integrated at different levels in the Postpalatial communities (Bettelli 2002, 136). Future and more thorough study of these and other patterns (pottery, metals, funerary rites) will clarify the character and the value of this interconnection. Banou, E. A., Nicgorski, and R.A.K. Smith. Forthcoming. “The Pottery.” In: J. Soles, C. Davaras and N. Papadakis (eds. ), Mochlos III. Period IV. The Mycenaean Settlement and Cemetery. Belardelli, C. 1994. “La ceramica grigia.” In: R. Peroni and Trucco (eds. ), Enotri e Micenei nella Sibaritide I. Broglio di Trebisacce, 265-346. Taranto. Belardelli, C., and M. Bettelli. 1999. “La Raum 127 dell’Unterburg di Tirinto: distribuzione della ceramica pseudominia e HBW.” In: V. La Rosa, D. Palermo, L. Vagnetti (eds. ), Επί πόντον πλαζόμενοι. Simposio italiano di studi egei dedicato a L. Bernabò Brea e G. Pugliese Caratelli, Roma 18–20 febbraio 1998, 473-474. Roma. Benzi, M. 1996. “Problems of the Mycenaean Expansion in the South-Eastern Aegean.” In: E. De Miro, L. Godart, A. Sacconi (eds. ), Atti e memorie del Secondo Congresso Internazionale di Micenologia – III, 947-978. Roma. Bettelli, M. 1999. “Da occidente a oriente: uomini, modelli e manufatti dall’Italia all’Egeo nella tarda età del Bronzo.” In: V. La Rosa, D. Palermo, L. Vagnetti (eds. ), Επί πόντον πλαζόμενοι. Simposio italiano di studi egei dedicato a L. Bernabò Brea e G. Pugliese Caratelli, Roma 18–20 febbraio 1998, 461-472. Roma. Bergonzi, G. 1985. “Southern Italy and the Aegean during the Late Bronze Age: Economic Strategies and Specialised Craft Products.” In: C. Malone and S. Stoddart (eds. ), Papers in Italian Archaeology IV, Part III, Potters in Protohistory, BAR IS 245, 355–387. Oxford. Bettelli, M. 2002. Italia meridionale e mondo miceneo. Ricerche su dinamiche di acculturazione e aspetti archeologici, con particolare riferimento ai versanti adriatico e ionico della penisola italiana. Grandi contesti e problemi della protostoria italiana 5. Firenze. Blegen, C.W. 1928. “The Coming of the Greeks: The Geographical Distribution of the Prehistoric Remains in Greece.”, AJA 32: 146–154. Boyd Hawes et al. 1908. Gournia, Vasiliki and Other Prehistoric Sites on the Isthmus of Hierapetra, Crete. Philadelphia. Carancini, G.L., and R. Peroni. 1997. “La koinè metallurgica.” In: M. Bernabò Brea, A. Cardarelli, M. Cremaschi (eds. ), Le Terramare. La più antica civiltà padana, 595-601. Milano. Eder, B., and R. Jung. 2005. “On the Character of Social Relations between Greece and Italy in the 12th/11th C. BC.” In: R. Laffineur – E. Greco (eds. ), EMPORIA. Aegeans in Central and Eastern Mediterranean. 10th International Aegean Conference, Athens, 14–18 April 2004, Aegaeum 25, 485–495. Liège and Austin. Evans, A.J. 1928. The Palace of Minos II. London. Forsdyke, E.J. 1927-28. “The Mavro Spelio Cemetery at Knossos.” BSA XXVIII: 243–296. Furumark, A. 1941. The Mycenaean Pottery. Analysis and Classification. Stockholm. Furumark, A. 1992. Mycenaean Pottery III. Plates. Stockholm. Graziadio, G. 1999. “L’adozione della wishbone handle nell’Egeo: un aspetto trascurato dei rapporti cipro-egei.” In: V. La Rosa, D. Palermo, L. Vagnetti (eds. ), Επί πόντον πλαζόμενοι. Simposio italiano di studi egei dedicato a L. Bernabò Brea e G. Pugliese Caratelli, Roma 18–20 febbraio 1998, 365-377. Roma. Hallager, B.P. 1983. “Italians in Late Bronze Age Khania.” In: Magna Grecia e Mondo Miceneo. Atti del XXII Convegno di Studi sulla Magna Grecia, Taranto 7–11 ottobre 1982, 358-363. Taranto. Hallager, B.P. 1985. “Crete and Italy in the Late Bronze Age III Period.” AJA 89: 293–305. Hallager, E., and B.P. Hallager. 2000. The Greek-Swedish Excavations at the Agia Aikaterini Square Kastelli, Khania 1970–1987. The Late Minoan IIIC Settlement. Vol. II. Stockholm. Hallager, E., and B.P. Hallager. 2003. The Greek-Swedish Excavations at the Agia Aikaterini Square Kastelli, Khania 1970–1987 and 2001. The Late Minoan IIIB:2 Settlement. Vol. III. 254–256. Stockholm. Hood, S.F. 1971. “An Early Helladic III import at Knossos and Anatolian connections.” In : Mélanges de préhistoire d’archéocivilization et d’ethnologie offerts à André Varagnac, 427–436. Paris. Hood, S.F., and D. Smyth. 1981. “Archaeological Survey of the Knossos Area.” BSA Supplementary Volume 14, London. Hutchinson, R.W. 1939-40. “Unpublished objects from Palaikastro and Praisos.” BSA 40: 38–50. Jung, R. 2006. ΧΡΟΝΟΛΟΓΙΑ COMPARATA. Vergleichende Chronologie von Südgriechenland und Süditalien von ca. 1700/1600 bis 1000 v.u. Z.. Wien. Kalogeropoulos, K. 1998. Die frühmykenischen Grabfunde von Analipsis (Südöstliches Arkadien), Bibliothek der Archäologischen Gesellschaft zu Athen BD. 175. Athen. Kanta, A. 1980. The Late Minoan III Period in Crete. 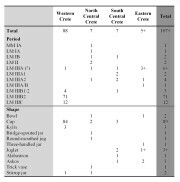 A Survey of Sites, Pottery, and their Distribution, SIMA 58. Göteborg. Khatzidakis, I. 1912.”Τύλισος Μινωϊκή.” ArchEph 51: 197–233. Kilian, K. 1988a. “Mycenaeans Up To Date. Trends and Changes in Recent Research.” In: L.B. French and K.A. Wardle (eds. ), Problems in Greek Prehistory. Papers Presented at the Centenary Conference of the British School of Archaeology at Athens, Manchester, April 1986, 115–152. Bristol. Kilian, K. 1988b. “Ausgrabungen in Tiryns 1982/3. Bericht zu den Grabungen. ” AA: 105–151. Macdonald, C.F. 1996. “Notes on Some Late Minoan IA Contexts from the Palace of Minos and its Immediate Vicinity.” In: D. Evely, I. Lemos, and S. Sherratt (eds. ), Minotaur and Centaur. Studies in the Archaeology of Crete and Euboea presented to Mervyn Popham, BAR IS 638, 17-26. Oxford. MacGillivray, J.A. 1998. Knossos: Pottery Groups of the Old Palace Period, BSA Studies 5, London. Marinatos, S. 1927-28. “Υστερομινωϊκός λαξευτός τάφος εν Καρτερώ Κρήτης.” ArchDelt 11: 68–90. Misch, P. 1992. Die Askoi in der Bronzezeit, SIMA PB 100, Jonsered. Peroni, R., F. Trucco and L. Vagnetti. 1986. “Broglio di Trebisacce (CS).” In: M. Marazzi, S. Tusa, and L. Vagnetti (eds. ), Traffici micenei nel mediterraneo: problemi storici e documentazione archeologica. Atti del convegno di Palermo, May 11–12 and Dec. 3–6, 1984. Istituto per la storia e l'archeologia della Magna Grecia, 55-69. Taranto. Platon, N. 1952. “Ανασκαφή ΥΜ ΙΙΙ λαξευτών τάφων εις την περιοχήν Επισκοπής και Σταμνιών Πεδιάδως Ηρακλείου.” Prakt 108: 619–630. Popham, M.R. 1974. “Sellopoulo Tombs 3 and 4. Two Late Minoan Graves near Knossos.” BSA 69: 195-257. Popham, M.R. et al. 1984. The Minoan Unexplored Mansion at Knossos, BSA suppl. 17. London. Rutter, J.B. 1979. “Stone vases and Minyan Ware: A Facet of Minoan Influence on Middle Helladic Laconia.” AJA 83: 464–469. Rutter, J.B. 1999. “Cretan External Relation During Late Minoan IIIA2–B (ca. 1370–1200 BC): A View from the Mesara.” In: W. Phelps, Y. Lolos, and Y. Vichos (eds. ), The Point Iria Wreck: Interconnections in the Mediterranean ca. 1200 B.C. Proceedings of the International Conference, Island of Spetses, 19 Sept. 1998, 139-186. Athens. Rutter, J.B. 2006a. “Minoan Pottery from the Southern Area : Neopalatial and Late Minoan Pottery.” In: J.W. Shaw and M.C. Shaw (eds. ), Kommos V. The Monumental Minoan Buildings at Kommos, 377-630. Princeton. Rutter, J.B. 2006b. “Ceramic Imports of the Neopalatial and Later Bronze Age Eras.” In: J.W. Shaw and M.C. Shaw (eds. ), Kommos V. The Monumental Minoan Buildings at Kommos, 646–688. Princeton. Rutter, J.B., and C.W. Zerner. 1984. “Early Hellado-Minoan Contacts.” In: R. Hägg - N. Marinatos (eds. ), The Minoan Thalassocracy: Myth and Reality. Proceedings of the 3rd International Symposium at the Swedish Institute in Athens, 31 May–5 June 1982, 75-83. Stockholm. Smith, R.A.K. 2005. Mycenaeans and Mokhlos: The Formation of regional Identity in Late Minoan III Crete.” In: A. L. D’Agata and J. Moody (eds. ), Ariadne’s Threads: Connections between Crete and the Greek Mainland in the Postpalatial Period (LM IIIA2 to LM IIIC), Tripodes 3, 190-199. Athens. Tsipopoulou, M., and L. Vagnetti. 1994. “A Late Minoan III Grey Wheel-made Pirifiorm Jar from Eastern Crete.” SMEA 34: 43–50. Tzedakis, I. et al. 1989. Nerokourou: Scavi a Nerokourou, Kydonia, I, Ricerche greco-italiane in Creta occidentale. Roma. Vagnetti, L. 1985. “Late Minoan III Crete and Italy: another view.” PP: 29–33. Watrous, L.V. 1992. Kommos III. The Late Bronze Age Pottery. Princeton. Zerner, C.W. 1978. The Beginning of the Middle Helladic Period at Lerna, Ph.D. diss. University of Cincinnati. (University Microfilms 79–04772). Zerner, C.W. 1993. “New Perspectives on Trade in the Middle and Early Late Helladic Periods on the Mainland.” In: C.W. Zerner, P. Zerner, and J. Winder (eds. ), Wace and Blegen: Pottery as Evidence for Trade in the Aegean Bronze Age 1939–1989. Proceedings of the International Conference held at the American School of Classical Studies, Athens, Dec. 2–3, 1989, 39-56. Amsterdam. Zerner, C.W. Unpublished. Lerna V: Area D. Unpublished manuscript. 1 I am grateful to Angus Smith for having informed me about the unpublished wheel-made grey vessels from Mochlos cemetery. Girella, L. "A Survey of Grey Wares on Crete in Middle and Late Bronze Age." 23 Jun. 2007. In: Horejs, B. - Pavúk, P. (eds. ): Aegean and Balkan Prehistory. http://www.aegeobalkanprehistory.net/index.php?p=article&id_art=2 (23 Apr. 2019).